Yoga helps to build self-awareness. It takes you on a journey inside the body, mind and spirit. Though great to get a feel for what’s going on inside, yoga’s also supposed to be about connection and that means not getting stuck only in the connection with self. Though it can happen easily enough. Getting caught in your mind, your thoughts, your small little world only to end up noticing nothing at all about the rest of your life. Waking in the morning you hop into the shower and start thinking about your day. Then, trying to remember whether you already shampooed your hair or not. You do it all again, just in case. Into the car, driving kids to school and making your way to work. Arriving, you might open the car door and wonder … “how did I even get here? I don’t remember most of the drive.” Home at the end of the day. Busy household. Dinner eaten. Asking DH if he would prefer tea or coffee to finish off the meal. “What did you say?” you ask again, as you didn’t listen to the answer the first time around. You were somewhere else in your thoughts. In a totally different, time, space, or conversation. Screeeeeech!!!! How did that happen? How is it you can do so much in a day but barely recall any of it? It might be due to the fact you’re getting older and your memory’s not what it used to be. More likely, you’re just not paying attention. Not being, in any of it. Today, perhaps due to the way the morning began, I was reminded to look around. Waking early, I made my way into the cold quiet room where I’m attempting to sit in silence 10 minutes before starting the rest of my day, my routines. With air conditioners turned off, the quiet this morning allows me to hear the Adhan, or the Islamic call to prayer around the neighborhood. First one, then another coming from the minarets at each mosque. I hear at least three, maybe four, all with slightly different timing and voices calling the faithful to begin their morning with discipline and dedication, somewhat similar to my undertaking. I finish teaching my class and begin making my way home. Approaching the roundabout near Al Jazeera, traffic is at first halted. Suddenly the pace picks up as a police officer motions everyone to quickly move on. The police officer standing on the street with his semi-automatic weapon slung casually over his shoulder. Most likely preparing for the passing by of our country’s leader, with his entourage, heavily guarded. Most days it feels like I could be doing what I’m doing back home in Canada, or anywhere really. I go about life, probably in much the same way as most. What makes it interesting, what makes it different, is to bring some awareness to what’s happening. Just going through the motions can be pretty dull. Not that those statements are profound in the least, but sometimes I forget and need subtle reminders like I was given today, to help get me on track. That is truly what most working moms go through every day in every country I think, and I remember getting home and thinking “I don’t even remember the drive” We should pay more attention to the world around us – there is always something to learn. However . 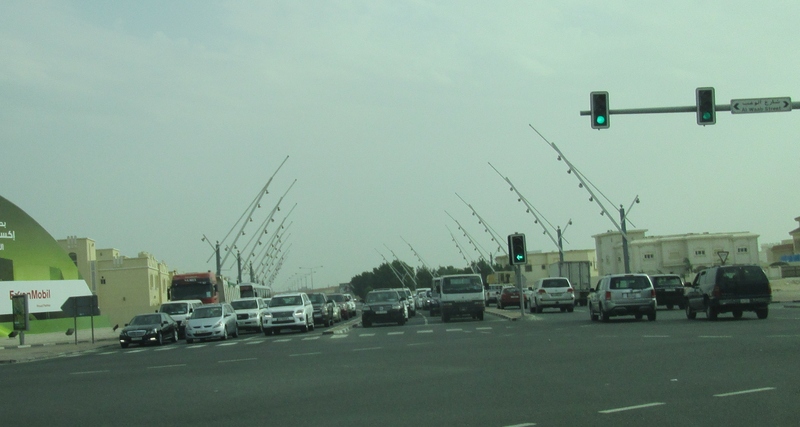 .. if you can learn to navigate Qatar traffic without noticing what is going on. . . you are Wonderwoman !! Thanks for the wake-up call to “pay attention”. And Oh how I would have loved to be on that rooftop looking down.